No Country for Visually Challenged Persons? Peace March to US Embassy: No To War On Syria! Workers at the Bajaj Auto's Chakan unit in Pune stopped work for 50 days before unconditionally withdrawing the agitation on 13 August. The union made a controversial demand - cheap equity shares for its members. This article looks at this demand, the questions around the issue of going on strike (in the current economic atmosphere), the ability to sustain it and the lack of adequate state intervention. When 950 workers at the Chakan (Pune) plant of Bajaj Auto struck work on 25 June, among their demands for improved wages and work conditions was one that generated much controversy – the union asked for equity shares, or what is called employee stock ownership plan (ESOP), at Re 1 a share. While a number of information technology (IT) companies and a few in other fields are no strangers to ESOPs in India, this was the first time that workers from the assembly and production floor made the demand. The demand for ESOP was dismissed in no uncertain terms. “No one, not even the chairman, has got free shares in the last 50 years, and we are not about to start now,” Rajiv Bajaj, managing director (MD) of Bajaj Auto, told the media. He added for good measure that if the workers’ demand is like that of a wayward child, the company, as a parent, had to be “fair but firm”. In another media interview, he said, “This is a public limited company, not a kirana (grocery) shop that I can handle (company) shares like that” (Gupta and Baggonkar 2013). Bajaj also made it clear that his company did not believe in “buying the loyalty of people by throwing them shares”. ESOPs are okay for the IT industry or where capital is an issue, and even the automobile companies that issue shares do so only to the top management in their research and development (R&D) division and not to workers, he said. Bajaj’s almost indignant response to the demand and the union’s justification for making it shows the chasm between how managements view workers’ role and how the latter see it. The Vishwa Kalyan Kamgar Sanghatana (VKKS), the local union that led the strike at the plant that makes the auto giant’s popular Pulsar motorcycle and has a capacity of 3,000 units a day, clarified that it was not on strike, but had “stopped work”. Dilip Pawar, president of the union, explained the reason behind the unique demand for cheap equity shares. “We are the ones producing the wealth, why should we not have a share in it? Since the management is not paying us fair wages and is refusing to review the wage agreement, we thought shares via the share dividends of the company are a fair exchange,” he said (personal interview). He clarified that the union was demanding individual, not group shares. The latter would have given the workers a stake in the management and it would not be easy to sell them off, as in the case of individual shares. Bajaj Auto has been offering gradually higher dividends to its shareholders over the years. A dividend of Rs 45 per share was announced for 2013 compared to Rs 22 per share in 2009. The company is considered the “world’s most profitable” two-wheeler manufacturer (Philip 2012). The VKKS, in a document circulated via email, alleged that the compensation paid to workers has not kept up with the company’s profits, which have been rising over the past decade or so. It claims that for every Pulsar motorcycle produced, the workers as a whole get only Rs 300, while management staff and shareholders get Rs 16,700 and the government and dealers Rs 10,000 each. Further, in Pune, inflation as measured by the consumer price index for industrial workers grew by 11.7% in 2010 over 2009, and by 10.5% in 2011 over 2010 (Labour Bureau 2012). It was even higher in other towns and cities of Maharashtra. The workers’ demand for shares in the company, they said, was mainly to ensure proper compensation for work, which has been inadequate in the wage agreements negotiated from time to time. The last wage agreement was for a period of nine years (ending 2019), with a revision every three years. The workers nullified this agreement and asked for shares in the company. This demand was uncommon, but not so outrageous as some sections of the business newspapers made it out to be. In the early 1990s, the Bharat Electronics Limited Union in Bangalore sought shares for workers. In the context of this, Bhowmik (1994) raised some pertinent questions on worker-shareholders and how it could potentially alter worker-management and worker-union relationships. It was the fear of a changed worker-union relationship that has made some unions apprehensive of such schemes. Also, they see the sale of shares to workers as a way of privatising public-sector companies through the back door. Bhowmik has also looked at the worker-shareholders experience in other countries. ESOPs have been “successful” in the US in terms of the number of companies that have implemented such plans, and the number of workers who have become shareholders in the companies they work for. In India, however, the question of worker-shareholders was most debated with respect to public-sector companies which through the 1990s (it continues even today) offered shares to their employees at discounted prices. In the US, ESOPs have been largely successful in small and medium enterprises, which, according to Bhowmik, provide the bulk of employment to American workers. A more recent article in the Nation (Mackin 2011) says that about 11,000 companies employing nearly 12 million workers and operating in all sectors of the economy have worker-shareholders. The number of employees in each of these companies range from 50 to 1,50,000. The US experience has been made possible by the laws in place. Companies are offered tax incentives for enrolling in the ESOPs scheme, and workers are allowed to form trusts and borrow capital to purchase shares collectively. These two critical provisions make ESOPs lucrative for companies and possible for workers. However, Bhowmik argues that this had little bearing on the decision-making in companies with ESOPs, as there was a clear distinction between ownership and control, and this has been a bone of contention between workers and companies. For example, the United Auto Workers (UAW), one of the largest unions in the US, owns substantial portions of major corporations and is itself valued in billions of dollars. It has been many a times accused of acting against the interests of workers. The UAW owns a large number of shares in Ford, Chrysler and General Motors, among others. It is a big player and has been accused of allowing anti-worker policies in these companies because it has a direct interest in their profits (White 2010). The UAW has supported the policies of the Barack Obama administration to restructure the auto industry, for which it has been severely criticised (White 2013; Jones 2013). Further, ESOPs in the US have not led to any sea change in the hierarchy within factories. The various methods used to exclude workers from decision-making have ensured that they continue to have limited information about or limited say in managerial decisions (Russel et al 2004). Canada’s experience has been different. Workers, with the support of the government and unions, have established cooperatives. Ownership via cooperatives has been more meaningful, according to Bhowmik. Further, the cooperatives have continued to enjoy the support of unions. This has exposed workers to management techniques and built up their awareness, both of which are important if they are to eventually organise production. In India, ESOPs, in general, have been mainly offered to middle and higher management employees at a discounted price or as bonuses. This is a common practice in the IT sector, which sees giving shares to employees as a way of retaining talent. Companies like Infosys have been able to do this with some success (Kumar 2001). But most shareholder-employees have no real say in the management of the companies. ESOPs do not mean collective bargaining. They are still largely viewed as plans for individual shareholding. But the only way employees, with or without ESOPs, can have a meaningful say in matters of management and company policy is when they unite, or collectivise. While the VKKS’ unexpected demand for ESOP became a talking point, the “unconditional withdrawal” of the 50-day agitation on 13 August raises a number of questions. 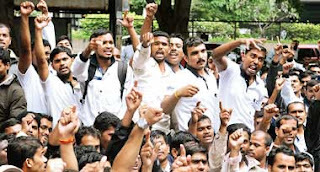 Apart from the Shramik Ekta Mahasangh (SEM), representing 88 unions in the Pune industrial belt, the National Trade Union Initiative (NTUI) and some other unions had supported the strike. Many had hoped that with the Maruti Suzuki workers in Manesar carrying on a tenacious struggle, this agitation would also pave the way for a vigorous debate on labour reform. The VKKS pointed out that the speed of assembly lines has gone up a good deal in the last six years – from 42 seconds per motorbike to 28 seconds, resulting in 1,028 two-wheelers being produced daily. Pawar said that many of the young workers suffered from kidney stones because of the unrelenting pace and a fall in the number of “relievers”. From the five to seven relievers needed for every 75 workers (so that the latter can go to the toilet or to drink water), the number has come down to three. There is also the issue of contract labourers. The VKKS alleged that the company was using contract labourers and the “learn and earn” diploma holders to try and break up the agitation. Pawar said production-line workers never got an opportunity to talk to the top management and had to deal with the middle-level management members who could not be relied upon to give a fair assessment of the workers’ problems and issues to the higher-ups. The VKKS says that the Bajaj Auto management was upset with Pawar because workers at its Pantnagar (Uttarakhand) unit approached him to resolve their issues. When Pawar attempted to organise the workers in a state not known for workers’ movements, it led to allegations that he was “provoking” them, it says. Workers of the Pantnagar plant, established in 2007, had approached the VKKS to take up their demands. In 2012, they went on strike, mainly for the right to form a union and the VKKS supported the agitation. The VKKS alleges that it was after this episode that relations at the Chakan plant became strained. According to VKKS, the Bajaj Auto management suspended 22 workers in Chakan after June 2012. It also refused to revise the wage agreement. The agreement of 2010 stated that in case employees of Bajaj Auto were given a higher increment than that mentioned in the wage agreement, this higher increment would be applicable to those covered by the agreement as well. The management violated this clause, according to the VKKS. The VKKS was only recognised in 2007 after a prolonged struggle. The Bajaj management had responded by shutting down its Akurdi plant (where the union was first established) and shifting production to Aurangabad and Uttarakhand in September 2007. Finally, after a court order, the Bharatiya Kamgar Sena (backed by the Shiv Sena) was derecognised and the VKKS was recognised as the majority union that would represent workers (Menon 2007). Drawing a parallel with the Maruti Suzuki workers’ struggle, N Vasudevan of the NTUI observed, “In both places young workers, most below 35 years, have health issues because they have to work at tremendous speed that makes them into machines rather than human workers.” Interestingly, when asked about these allegations, Bajaj said that the company followed the “Kaizen technique of constant improvement. There used to be seven relievers, which was reduced to six, five, four, and so on. At Bajaj Auto , we are constantly improving our standards and reducing wastage” (Byatnal 2013). For Indian workers and especially for their leaders, the real dilemma is keeping up their morale at a time when the prices of essentials are skyrocketing, jobs are scarce, and managements are threatening to shift production to other plants (as Bajaj did) instead of negotiating. Having called a strike, keeping internal dissent in check and knowing when to call it off calls for skill and strategy. For now, on the face of it, it seems that the VKKS has got nothing to show for the 50-day agitation. Media reports also suggested that the workers had gone on strike at the wrong time when the automobile sector in that region was staring at production cuts and job losses (Gupta and Joshi 2013). While the SEM did support the VKKS, there was no industry-wide strike or action, and no show of solidarity from civil society. Even the media coverage was restricted to daily follow-ups with hardly any discussion of the issues raised. The state government too remained a mute spectator, with the labour minister having called just one unsuccessful meeting. But as Ajit Abhyankar of the Centre of Indian Trade Unions (CITU), Pune, says, “That this union was able to keep the young workers united and carry on the struggle for 50 days is itself a triumph and a victory”. The practice of offering ESOPs may be here to stay, or at least this can be a reasonable assumption after a recent ruling by a special bench of the Bangalore income tax appellate tribunal. Following an application filed by Biocon, it ruled that discounts under ESOPs are an employee cost and that it should be eligible for a tax deduction (Kably 2013). This may prove to be an incentive for private companies to give discounted shares to employees, including shop-floor workers. Bhowmik, K Sharit (1994): “Workers as Shareholders: Case for Closer Examination”, Economic & Political Weekly, 29(40). Byatnal, Amruta (2013): “Bajaj Protests: Talks Aim at Job Security for Suspended Workers”, The Hindu, 11 August. Gupta, S D and H Joshi (2013): “How Downturn Helped Bajaj Quell Chakan Strike”, Business Standard, 15 August. Gupta, S D and Swaraj Baggonkar (2013): “This Is Not a Kirana Shop that I Can Handle Shares Like that: Rajiv Bajaj”, Business Standard, 28 June. Jones, Shannon (2013): “UAW and Fiat Battle Over Union’s Multi-billion Dollar Stake in Chrysler”, World Socialist Website, 23 May. Kably, Lubna (2013): “Companies Can Get Tax Breaks on Employee Stock Option Plans”, The Times of India, 18 July. Kumar, Nagesh (2001): “Indian Software Industry Development: International and National Perspective”, Economic & Political Weekly, 36(45): 4278-90. Labour Bureau (2012): Consumer Price Index Numbers For Industrial Workers Annual Report 2011 (Shimla: Labour Bureau). Mackin, Christopher (2011): “Employee Ownership: The Road to Shared Prosperity”, The Nation, 8 June. Menon, Sudha (2007): “Biggest Bajaj Auto workers union gets court recognition”, LiveMint, 17 October. Philip, Lijee (2012): “Hero Powers on Minus Honda, Beats TVS; Bajaj Auto Takes the Race to Global Tracks”, The Economic Times, 25 March..
Russell, John D, Mark Dirsmith and Sajay Samuel (2004): “Stained Steel: ESOPs, Meta-Power, and the Ironies of Corporate Democracy”, Symbolic Interaction, 27(3). White, Jerry (2010): “UAW Membership Continues to Plummet”, World Socialist Website, 1 April. – (2013): “UAW Sanctions Elimination of the Eight-hour Day at Chrysler”, 2 March. Interesting to know about the situations faced by Bajaj and overall it was all fine. Bajaj are well known for their 3 wheeler manufacturers!